Annette’s images fuse activity with contemplation. Through her energetic mark making, her works encompass a sense of the artist’s own excitement in the moment of making. Yet, simultaneous to this electric energy, there is a corresponding steadiness in Annette’s work. Her subjects appear snapped in moments of pause. Annette’s images are surreal and dreamlike, reminiscent of scenes by Marc Chagall. She confidently distorts figures, heightens colours, and exaggerates form. 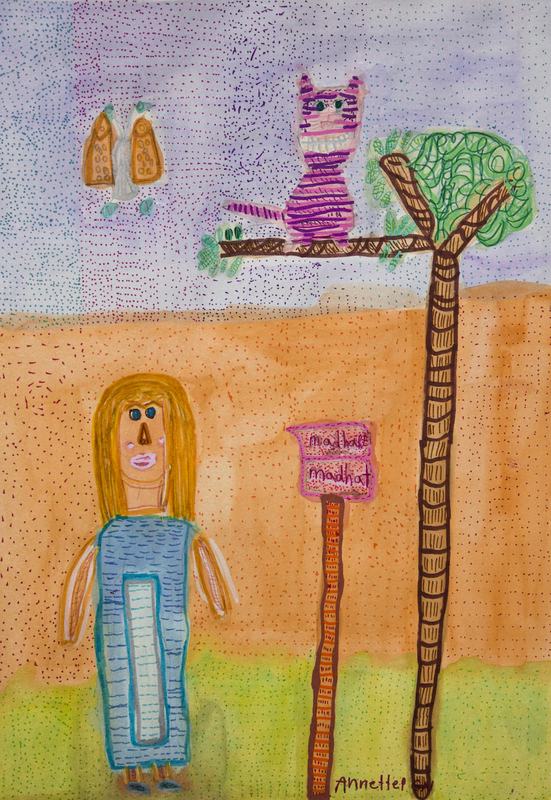 The artist deconstructs and flattens her subject matter, decoding people, landscapes and birds into abstracted shapes. In the process Annette arranges her subjects into beautiful patchworks of pattern. Annette’s imagery has an intriguing awkwardness. But, it is in this bold awkwardness that they perform their charm and allure. 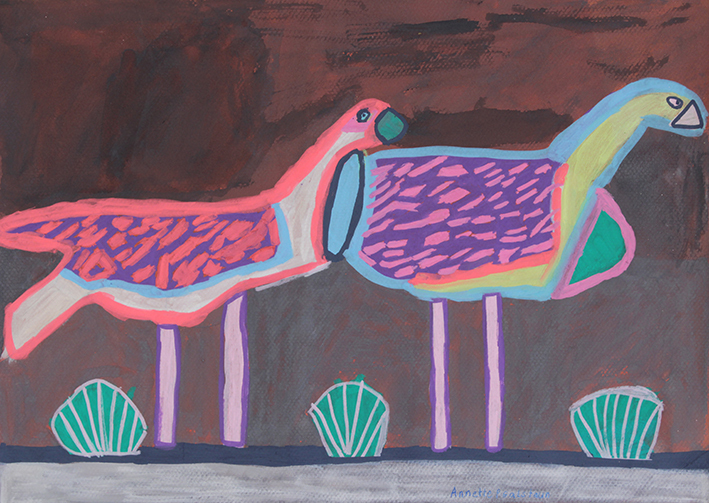 Lyrical, quirky, curious and beautiful all describe Annette Gaulston’s work. Annette has recently begun drawing and painting scenes from her favourite childhood fairy tales, movies and television series. Scenes from Snow White, Captain Planet or Disney’s Mulan bring forth a sense of humorous nostalgia. 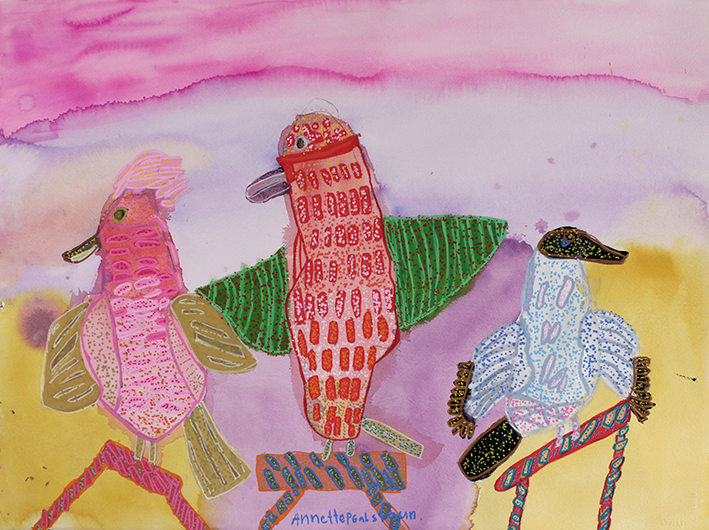 Two of Annette’s paintings were developed into a textile design for her collaboration with The Social Outfit. The design becoming one of the highlights of their King Botanic Spring/Summer 2018-2019 collection. Annette Galstaun collaborated with The Social Outfit to design the Lioness print, one of the highlights of King Botanic The Social Outfit’s Spring/Summer 2018-19 collection.